Cornell University will feature newly-elected New York US Representative Alexandria Ocasio-Cortez’s “campaign shoes” in an art exhibit beginning next week. Also featured will be US Supreme Court Justice Ruth Bader Ginsburg’s judicial collars and an outfit worn by former US Attorney General Janet Reno. The items at the Cornell Council for the Arts’ “Women Empowered: Fashions From the Frontline” display allegedly represent “women’s empowerment,” according to The Cornell Daily Sun. Fiber science and apparel design professor Denise Green said Ocasio-Cortez’s footwear is a “unique” addition as “worn clothing items are not often displayed” in exhibits. 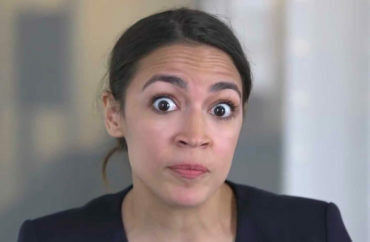 In order to obtain the shoes, Green reached out to Ocasio-Cortez’s team. According to Green, Ocasio-Cortez glady loaned the shoes for the exhibit; however, she did not gift them to Cornell since they mean so much to her. In addition to Ocasio-Cortez’s shoes, the exhibit will also feature items of clothing worn by other women throughout history. T-shirts from monumental occasions like the Stonewall Riots are also displayed. The entire collection will highlight approximately 17 pieces. “One of the things that fashion does that is really profound is that it allows you to display a message or an idea and visually you come into contact with people and you transform those people … through your appearance,” Green said. Students in the graduate course entitled “Anthropology of the Fashion Body” taught by Green were tasked with curating the exhibit. Du Puis, a student in the class, said the class brainstormed “different spaces where women use fashion as a means of empowerment” and came up with five areas: the sports arena, the street, the stage, the academy and the government. Jenny Leigh Du Puis, a member of the exhibit’s curatorial team, said she and her colleagues wanted “different types of women” represented … but political ideology doesn’t seem to be included in that “different.” After all, inspiration for the 17 featured pieces of clothing came from “pussyhats” worn at various Women’s Marches. “[I] kept coming up with examples in my head of all these different ways women had used fashion in the past to create social change,” Professor Green said.